LED LCD Display+Touch Screen+Bezel Assembly for Lenovo Yoga 3 Pro 80JH 14"
•​For : Lenovo IdeaPad Yoga 3 Pro 80JH 14". for Lenovo IdeaPad Yoga 3 Pro 14". Compatible Model : For Lenovo IdeaPad Yoga 3 Pro 14". LCD Touch Screen Assembly with bezel. •​ LCD Model: N140HCE-EBA or LP140WF3-SPL2 or compatible. •​For : Lenovo Yoga 900-13 / 13ISK / 13ISK2 | Modell 80MK 80UEetc. for Lenovo Yoga 900-13. Compatible Product Line : For Yoga 900-13. Compatible Model : For Lenovo. LCD Touchscreen Assembly Bezel. •​LCD Model: LP133QD1(SP)(A1) or compatible. Trending at AU $235.54eBay determines this price through a machine-learned model of the product's sale prices within the last 90 days. This is a Lenovo G51-35 Full Display Assembly with Hinges, antennae, and webcam that was sourced from an ex demo unit. Genuine Lenovo G51-35 Full Display Assembly with Hinges, antennae, and webcam. Lenovo P/N: N/A. Lenovo full top assembly, LED screen, touch screen glass, hinges, cables and back cover. This item has broken touch screen glass, but display is working, no problem. Genuine Lenovo ideapad 300-15isk Display assembly. This is a genuine Lenovo ideapad 300-15isk Display Assembly,including cover, display cables,hinges, LCD screen and Webcam. Lenovo P/N: Not applicable. COMPUTER TO BE RESTORED TO FACTORY SETTINGS BEFORE PURCHASE! Lenovo ideapad Z560 purchased late 2011. Was used often between 2012-2014 and has been sitting idle since early 2015. All in good working order aside from - Battery will need to be replaced. Works, but needs to be connected to a charger after 5 or so minutes. Left Mouse Button is slightly worn, causing extra effort to click. An additional 4gb of RAM was added after market - total 8gb RAM now. Also upgraded the computer from Windows 7 to 8. Hard drive is 500gb. i5 Intel Core. 64 bit. This is a genuine Lenovo Yoga 300-11IBR Display Assembly sourced from an ex demo unit. Genuine Lenovo Yoga 300-11IBR Touch Panel Display Assembly. Lenovo P/N: N/A. Manufacturer Lenovo. Lenovo P/N N/A. This is a Genuine Lenovo G40-45 Full Display Assembly that was sourced from an ex demo unit. Genuine Lenovo G40-45 Display Assembly. Lenovo P/N: N/A. Manufacturer Lenovo. Lenovo P/N N/A. Note: Images used for illustration purposes only. Laptop Models This is an OEM LCD Panel which will replace the model listed in the title. For Lenovo X1 carbon 2nd Gen, QHD 2560x1440, non touch, 40 pin. Genuine / Original LENOVO 14" FHD NON-GLARE,TP,LBO AUD Touch Screen for Lenovo Thinkpad X1 Yoga 00UR189. (You need to Pull Off the Power Adaptor &Battery Cable when install). LP141WP1-TLC3, LP141WP1(TL)(C3), LP141WP1-TLC1, LP141WP1(TL)(C1),LP141WP1-TLC2, LP141WP1(TL)(C2). LP141WP1-TLB3, LP141WP1(TL)(B3), LP141WP1-TLB8, LP141WP1 (TL)(B8). Lenovo ThinkPad T400 LCD LED Screen 14.1" LP141WP1 (TL)(B8) WXGA 1440x900 (Matte) LCD Screen Panel. This is a Lenovo Yoga 3 pro Complete Screen Assembly. Item Specifications. Approx weight 550g. Pickup available. Genuine Lenovo Ideapad 100-15ACL Display Assembly. This is a genuine Lenovo Ideapad 100-15ACL Display Assembly. Lenovo P/N:N/A. Manufacturer Lenovo. Lenovo P/N N/A. Note: Images used for illustration purposes only. Genuine Lenovo Yoga 510 LCD Screen Display Assembly. This is a Genuine Lenovo Yoga 510 LCD Assembly. Lenovo P/N: N/A. Manufacturer Lenovo. Lenovo P/N N/A. Note: Images used for illustration purposes only. Brand LENOVO Screen Size 12.5" Aspect Ratio 16:9 MPN TS--LCDASSEMBLY-LENOVO-YOGA720-12 Max. Resolution 1920x1080 Compatible Brand For Lenovo Compatible Product Line Lenovo Yoga 720-12IKB Screen Finish Glossy Display Technology LED LCD Country/Region of Manufacture China UPC 748440386062 Warranty 120Days. Genuine Original Lenovo 510-15ISK - Complete Top Case FHD 15.6" LCD Screen Charcoal Silver. Display Resolution : FHD. Pulled out from faulty Motherboard Lenovo 510-15ISK. LCD Screen is in very good condition - very clean. Notebook IP MIIX 700-12ISK 6Y 4G 128 10P 80QL00BWAU (80QL-00BWAU). Notebook IP MIIX 700-12ISK 6Y 8G 256 10P 80QL00BJAU (80QL-00BJAU). Notebook IP MIIX 700-12ISK 6Y 8G 256 10P 80QL00BHAU (80QL-00BHAU). Screen Size 11.6" Compatible Brand For Lenovo Compatible Product Line For Lenovo Yoga 700-11ISK Screen Finish Glossy Display Technology LED LCD Max. Resolution 1920x1080 MPN Does Not Apply UPC 748440385782 Brand Lenovo Aspect Ratio 16:9 Warranty 120 days. Brand LENOVO Screen Size 15.6" Aspect Ratio 16:9 MPN AT-LCDSCREEN-T540P-W540 Max. Resolution 2880x1620 Compatible Brand For Lenovo Compatible Product Line For Lenovo ThinkPad T540P W540 Screen Finish Matte Display Technology LED LCD Country/Region of Manufacture China UPC 711301611443. Brand Lenovo Screen Size 13.3" Aspect Ratio 16:9 MPN AD-LCDASSEMBLY-YOGA720-13 Max. Resolution 1920x1080 Compatible Brand For Lenovo Compatible Product Line For lenovo YOGA 720-13IKB Screen Finish Glossy Display Technology LED LCD Country/Region of Manufacture China UPC 748440385973. 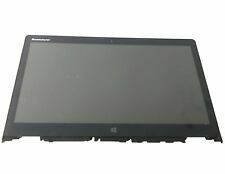 100% NEW Factory Source Original NEW 14.0" LCD Screen Display Led Touch Digitizer for Lenovo Thinkpad X1 Yoga. Backlight Type: LED. Status: New, Grade A . Technology: Active Matrix TFT. For Lenovo IdeaPad Miix 700-12 & Miix 4. •​For : Lenovo IdeaPad Miix 700 12" / 700-12ISK / 80QL / Miix 4. Compatible Model : For Lenovo IdeaPad Miix 700-12ISK. •​LCD Model: LTL120QL01-001. We will solve the problem for you. New listingLenovo ThinkPad L450 - 14"
Condition is Used. Part Number: 20DT002MAU. Accessories Included: AC Adapter. Ethernet Connection (3) I218-LM, Ethernet. USB Port (3), LAN Port (Yes), Display Port (Mini), VGA Port (Yes). Fingerprint Scanner. Brand LENOVO Screen Size 12.5 in Aspect Ratio 16:9 MPN TS-LCDASSEMBLY-YOGA260-1920X1080-1 Max. Resolution 1920 x 1080 Compatible Brand For Lenovo Compatible Product Line For Lenovo Thinkpad Yoga 260 Screen Finish Glossy/ Matt Display Technology LED LCD Country/Region of Manufacture China UPC 748440386437. Brand lenovo Screen Size 14 in Aspect Ratio 16:9 MPN AD-LCDASSEMBLY-T450S-1920x1080-B Max. Resolution 1920 x 1080 Compatible Brand For Lenovo Compatible Product Line Lenovo ThinkPad T450S 20BX000XGE Screen Finish Glossy/Matte Display Technology LED LCD Country/Region of Manufacture China UPC 713524594459. Brand LENOVO Screen Size 11.6 in Aspect Ratio 16:9 MPN TS-LCDASSEMBLY-YOGA710-11-1920X1080-B Max. Resolution 1920 x 1080 Compatible Brand For Lenovo Compatible Product Line For Lenovo Yoga 710-11ISK 80TX Screen Finish Glossy/Matte Display Technology LED LCD Country/Region of Manufacture China UPC 748440386703. Brand Lenovo Screen Size 15.6" Aspect Ratio 16:9 Max. Resolution 1920x1080 Compatible Brand For Lenovo Compatible Product Line For Lenovo Flex 2 15 15D Display Technology LED LCD MPN Does Not Apply UPC 748440385768 Application Touch LCD Screen with Bezel Warranty 120 days. Brand LENOVO Screen Size 12.5 in Aspect Ratio 16:9 MPN TS-LCDASSEMBLY-YOGA260-1920X1080 Max. Resolution 1920 x 1080 Compatible Brand For Lenovo Compatible Product Line For Lenovo Thinkpad Yoga 260 Screen Finish Glossy/ Matt Display Technology LED LCD Country/Region of Manufacture China UPC 748440386420. Brand Lenovo Screen Size 13.9" Aspect Ratio 16:9 MPN TS-LENOVO-YOGA910-LCDASSEMBLY-1920 Max. Resolution 1920x1080 Compatible Brand For Lenovo Compatible Product Line For Lenovo Yoga 910-13IKB 80VF Screen Finish Glossy Display Technology LED LCD Country/Region of Manufacture China UPC 713524939243. Brand Lenovo Screen Size 13.3" Aspect Ratio 16:9 MPN TS-LCDASSEMBLY-YOGA720-13 Max. Resolution 1920x1080 Compatible Brand For Lenovo Compatible Product Line For lenovo YOGA 720-13IKB Screen Finish Glossy Display Technology LED LCD Country/Region of Manufacture China UPC 748440385966. Display Technology LED LCD Assembly Screen Size 13.3" Compatible Model For Lenovo Yoga 900 UPC Does not apply MPN Not Applicable Compatible Brand For Lenovo Max. Resolution 3200*1800 Screen Finish Glossy Brand LENOVO Warranty 120 Days. Screen Size 13.3" Display Technology LED LCD Screen Finish Glossy Max. Resolution 3200X1800 Compatible Brand For Lenovo Compatible Product Line For Lenovo Yoga 900-13ISK UPC 748440385843 MPN Does Not Apply Brand Lenovo Warranty 120 days. Brand Lenovo Screen Size 14 in Aspect Ratio 16:9 MPN TS-LCDASSEMBLY-T450S-1920x1080-B Max. Resolution 1920x1080 Compatible Brand For Lenovo Compatible Product Line For Lenovo ThinkPad T450S Screen Finish Glossy/Matte Display Technology LED LCD Country/Region of Manufacture China UPC 748440386758. Brand Lenovo Screen Size 13.3 " MPN TS-LENOVO-YOGA213-LCDassembly Max. Resolution 1920*1080 Compatible Brand For Lenovo Compatible Product Line For Lenovo Yoga 2 13 Screen Finish Glossy Display Technology LED LCD Country/Region of Manufacture China UPC 713524939175. Brand LENOVO Aspect Ratio 16:9 MPN TS-YOGA720-12 Compatible Brand For Lenovo Compatible Product Line For Lenovo Yoga 720-12IKB Screen Size 12.5" Max. Resolution 1920 x 1080 Display Technology LED LCD Screen Finish Glossy UPC 748440386208. Brand Lenovo Screen Size 14" Aspect Ratio 16:9 MPN TS-LCDSCREEN-LenovoThinkPad-T470P Max. Resolution 2560x1440 Compatible Brand For Lenovo Compatible Product Line For Lenovo ThinkPad T470P T470S 01HW908 Screen Finish Matte Display Technology LED LCD Country/Region of Manufacture China UPC 713524594466. This is a genuine Lenovo Ideapad 110-15IBR LCD Assembly including cover, display cables,hinges, LCD screen and Webcam that was sourced from an ex demo unit. Genuine Lenovo Ideapad 110-15IBR LCD Assembly. Brand LENOVO Screen Size 14.0" Aspect Ratio 16:9 MPN TS-LCDASSEMBLY-YOGA520-14-1920x1080-B Max. Resolution 1920x1080 Compatible Brand For Lenovo Compatible Product Line For Lenovo Yoga 520-14ikb Screen Finish Glossy/Matte Display Technology LED LCD Country/Region of Manufacture China UPC 748440386604. Brand Lenovo Screen Size 14 in Aspect Ratio 16:9 MPN TS-LCDASSEMBLY-ThinkPadT450S-1920x1080-B Max. Resolution 1920x1080 Compatible Brand For Lenovo Compatible Product Line For Lenovo ThinkPad T450S Screen Finish Glossy/Matte Display Technology LED LCD Country/Region of Manufacture China UPC 713524594442. Brand Lenovo Screen Size 15.6 " Aspect Ratio 16:9 MPN TS-LCDASSEMBLY-S5YOGA15-1920x1080-B Max. Resolution 1920x1080 Compatible Brand For Lenovo Compatible Product Line For Lenovo Thinkpad S5 Yoga 15 Screen Finish Glossy/Matte Display Technology LED LCD Country/Region of Manufacture China UPC 748440386727. Lenovo LCD display / LED panel ThinkCentre edge M72z - 03T 6478. LCD display / LED panel for ThinkCentre edge M72z. Model Lenovo LCD display / LED panel ThinkCentre edge M72z - 03T 6478. ThinkCentre edge M72z. Brand Lenovo Screen Size 15.6 Aspect Ratio 16:9 MPN TS-LCDASSEMBLY-S5YOGA15-1920x1080-B Max. Resolution 1920 x 1080 Compatible Brand For Lenovo Compatible Product Line For Lenovo Thinkpad S5 Yoga 15 Screen Finish Glossy/Matte Display Technology LED LCD Country/Region of Manufacture China UPC 748440386734. Brand lenovo Aspect Ratio 16:9 MPN TS-YOGA720-13 Compatible Brand For Lenovo Compatible Product Line Lenovo YOGA 720-13IKB Screen Size 13.3" Max. Resolution 1920 x 1080 Display Technology LED LCD Screen Finish Glossy UPC 748440386178. Brand LENOVO Screen Size 12.5" Aspect Ratio 16:9 MPN AD--LCDASSEMBLY-LENOVO-YOGA720-12 Max. Resolution 1920x1080 Compatible Brand For Lenovo Compatible Product Line Lenovo Yoga 720-12IKB Screen Finish Glossy Display Technology LED LCD Country/Region of Manufacture China UPC 748440386079 Warranty 120Days. However, we will try our best to minimize it. 100% Money Back. SALES POLICY. Brand LENOVO Aspect Ratio 16:9 MPN TS-YOGA720-15 Compatible Brand For Lenovo Compatible Product Line Lenovo Yoga 720-15 15IKB Screen Size 15.6" Max. Resolution 1920 x 1080 Display Technology LED LCD Screen Finish Golssy UPC 748440386192. 100% Money Back. Easy & Secure. However, we will try our best to minimize it.